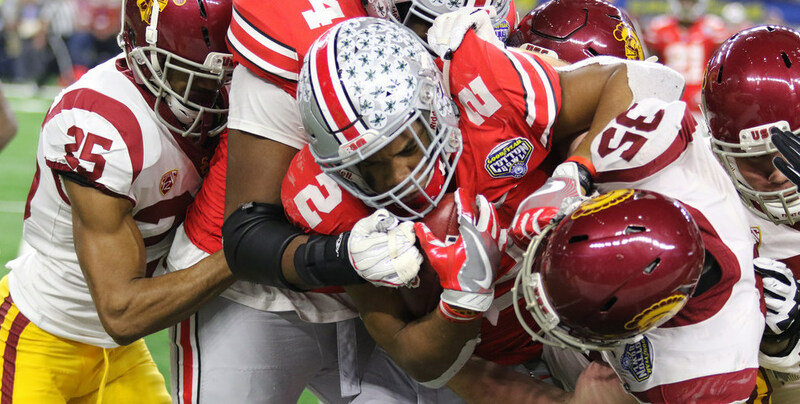 As a freshman, Ohio State running back J.K. Dobbins quickly made a name for himself. He finished second in the Big Ten with 1,403 rushing yards, found the end zone eight times and led the conference with an average of 7.2 yards per carry. Dobbins was one of the key components to a team that finished 12-2 after handing USC a 24-7 loss in the 2017 Cotton Bowl. But his production for Ohio State could've never happened. In fact, he could've been putting up those same numbers for a different program closer to home, a program that he just so happens to be pitted against this coming Saturday in TCU. When Dobbins was a freshman at La Grange High School, which sits 209 miles south of TCU on US Route 77, the Horned Frogs were the first Division I program to hand him a scholarship offer. "It was exciting. It was my first (offer) so I was high on them," Dobbins said of the Horned Frogs. "I know their coaches well so it's going to be fun to play against them." Last December, with Ohio State in Dallas for the Cotton Bowl, Dobbins said he liked TCU when they recruited him but he didn't think they'd run the ball. In March 2016, as a high school junior and a four-star recruit, Dobbins made his commitment to the Buckeyes. Dobbins also had offers from Houston, Texas, Texas A&M, Oklahoma and Oklahoma State among many others. But he chose to leave the southwest part of the United States and trade it for the midwest – and he's not the only one. Cornerback Jeffrey Okudah, who played his prep years at South Grand Prairie High School, received an offer from TCU in January 2015. The Horned Frogs were onto something. When Okudah committed to Ohio State in June 2017, he was the No. 8-ranked player at any position in the entire country, according to 247Sports. "Playing in Texas, in the area I grew up in, you faced some of the top talent each night," Okudah said. "(TCU) definitely came after me." At the time of his commitment to Ohio State, Okudah had narrowed his options to three: the Buckeyes, Florida State and Oklahoma. "From when I got (to Columbus), I was just comfortable with the coaching staff, the plan they set up for me," Okudah said in January 2017. "(Ohio State) puts a lot of defensive backs in the NFL and the life outside of football – they just have the whole nine yards." Okudah also made specific mention of former Ohio State defensive backs who are currently playing in the NFL. That, undoubtedly, played a major role in his choice. "I think (Ohio State's) reputation really preceded them," Okudah said. "As far as my position, Gareon (Conley), Marshon (Lattimore), Eli (Apple), (Bradley) Roby ... when you see that, you want to be one of the next guys in line." Middle linebacker Baron Browning is also a Texas native who was a part of Ohio State's famed 2017 recruiting class. Browning played at Kennedale High School and eventually chose the Buckeyes over Alabama. But he also had an offer on the table from TCU, coming in May 2015. His father, Barry Sr., even played for TCU in the 1990s. Browning's recruitment originally ended in July 2015 when he committed to Baylor. But when the university's Title IX problems came to light, he decommitted. That opened the door for Okudah to, possibly, play the biggest role in Browning's choosing of Columbus. Okudah and Browning visited Ohio State together the weekend of May 21-22, 2016. The joint visit, obviously, had a lasting effect on both. Ohio State cornerback Kendall Sheffield also received an offer from TCU while at Fort Bend Marshall High School in Missouri City, Texas. Sheffield was a part of Alabama's 2015 recruiting class but transferred to Blinn College after a reported lack of playing time. He then committed to Ohio State in January 2017. Right guard Demetrius Knox, a member of Ohio State's 2014 recruiting class, also received an offer from TCU when he was at Fort Worth All Saints Episcopal School, a 14-minute drive from TCU's campus. "I'm glad to be going back," Knox said. "I was born in Springfield, Ohio, but Texas will always be my home. I always like to call myself a southern guy. It's a completely different feel down there. I have a lot of respect for TCU. All Saints is like five minutes away." Knox committed to Ohio State in July 2013. "It was just a big blessing from God," Knox said. "Being from that area, from the DFW area, I just love the state of Texas. TCU, I was actually really considering TCU because as signing day got closer, I was like 'Yeah, I'm going to Ohio State. Can't wait. It's been my dream school since second grade.' But the thought of actually leaving Fort Worth and going to a whole new area ... I thought maybe I wanted to go to TCU. But I stuck to my guns." All five players will get a chance to play in front of friends and family as the Buckeyes take on TCU at 8 p.m. Saturday, in the AdvoCare Showdown at AT&T Stadium. But when they return back to Columbus, they'll still have a piece of home with them: each other. "You don't have to worry about getting homesick," Okudah said. "You kind of feel like you brought a part of home with you to Ohio."